NOTE: Environmental Trust funding for this project finishes July 31th 2018. Base level funding has been secured for 2018/19 thanks to Bega Valley Shire, SE Local Land Services, National Parks and Eurobodalla Shire Council. FUNDING: NSW Environmental Trust (until July 2018), BVSC, South East LLS, Eurobodalla Shire Council, National Parks and Wildlife Service. The Protecting the Wilderness Project commenced in 2007, under the premise that the coast of the Bega Valley Shire is one of the least weed-degraded coastal landscapes in south-eastern Australia and that timely weed control measures can maintain this status and accrue great environmental and economic benefit. The project receives funds from the NSW Environmental Trust (38%), the BVSC (25%), Southeast Local Land Services (25%), National parks and Wildlife Service (12%). It is hosted by FSCLA and managed by a broadly based steering committee of local agency stakeholders. Significant support in-kind is provided by the National Parks and Wildlife Service, BVSC and the various coastal Landcare groups. The project employs a local botanist, Stuart Cameron, as project officer. Stuart leads two six week duration 'sweeps' a year by crews from Local Aboriginal Land Councils along all local beaches, removing beach weeds and litter. 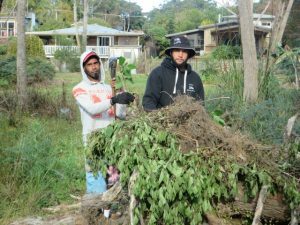 The crews also control weeds round local settlements at the request of and in collaboration with the coastal Landcare groups. A professional contractor/abseiler is engaged to deal with weeds in dangerous and inaccessible sites. Stuart continuously monitors weed problems along the coast and advises volunteer groups and agencies on issues and strategies and develops the contractor's work schedule. Since poorly chosen and managed garden plants are the principal weed threat 'awareness raising' is a key element of the project. Various media are employed including field days, newsletters, newspaper articles, brochures. The Four Winds Festival site near Bermagui is being developed as a showcase for the horticultural use of local species and a major planting program commenced there in winter 2015. The project has been highly successful in reducing the incidence of the key beach weeds, sea spurge and beach daisy, which are now vastly less common than at the project's commencement. Control of these species once absorbed the greater part of volunteer groups' time and energy. 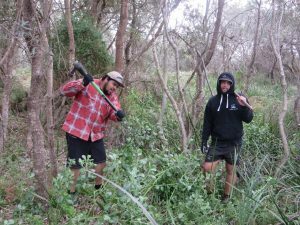 The groups are now able to concentrate on other projects, particularly revegetation works. Very significant progress has also been made in controlling bitou, boneseed, lantana, boxthorn, pampas grass, mirror bush and crofton weed, all species with the potential to massively degrade local environments but present only at a few 'bridgehead' sites locally. A current survey has established that major progress has been made in controlling these species in the past year.